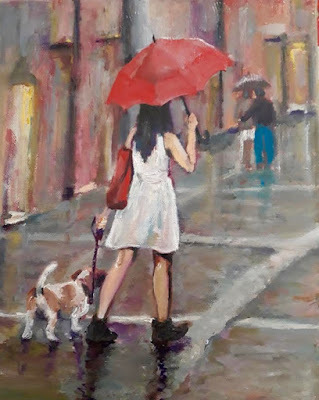 You have managed to make a rainy day look enticing with the red umbrella, little dog, and young girl. Un tiempo otoñal! Me gusta mucho la pintura, abrazos. Really well done, Jane. A beautiful painting! A new favorite! This is wonderful I see you went beyond the norm and put a dog in there and that is what makes it extra special to me, my friend. Buen trabajo, estupenda sensación de mojado de lluevia. Jane I just love this one...the dog beside the girl makes it extra special. Hope you are enjoying some lovely autumn weather. Hugs! This certainly looks like the rainy days we've had recently! The red umbrella and bag give it a pop! Excellent work! I love this - really conveys the feeling of a rainy day! I love this rain effect, along with the story that is conveyed!